Lou Wagstaff works as Sales Support for VPS, and joined the business in March 2018. Her day-to-day activities involve processing inbound and outbound orders, supporting Lee and Andrew, troubleshooting and implementing systems – “it’s a really varied role,” she says. 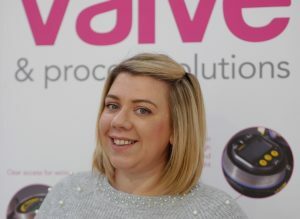 After spending the last decade in the gas meter distribution industry, Lou’s role marked her return to valves and actuators – and a reunion with some colleagues she worked with over ten years ago including MD Steve Pearson. What’s it like coming back to our industry? “Brilliant,” she says, “it’s really, really good. It’s nice to be part of a small and growing team, everyone chips in and pulls together. Outside of work Lou is a qualified nail technician and does lots of nails for friends and family. “I love spending time with my husband Martin and my dog,” she says. If you’re really lucky – and ask nicely – Lou will show you an unusual portrait of her much-loved dog, 3-year-old Lola, a pug and jack russell cross. Lou’s other interests include films, “and I have a massive love for 1980s music,” she says. What kind of eighties music, Lou? Sounds like we’ve been forewarned of the consequences if Lou gets the chance to compile any office party playlists!